I've finished it, written up a pattern of sorts, and posted it to Ravelry. A little kitsch is good for the soul, right? In my first bathroom, I had no room for anything like this. Not even the toilet tank top, because there was none. The toilet was an institutional-style one, with the pipe coming directly from the wall. All supplies were in the closet. 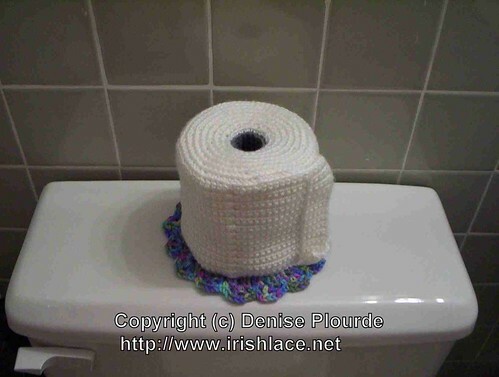 If the toilet roll was getting low, I propped a fresh one on the towel bar. It wasn't all that stable, but since no one ever visited, it worked well enough. Second bathroom, I had plenty of room, and lots of storage space in the cabinet under the sink. Easily reachable when on the throne. In this bathroom, I have almost no room. Spare toilet paper is stored in the closet. And... If someone ran out of toilet paper while on the pot, they'd be out of luck. So I wanted to keep a roll in the bathroom, but where? This bathroom does have a toilet tank, so that would work, but the idea of letting a roll of paper sit out and get dusty was not thrilling. OTOH, I didn't really want to hide the toilet paper. Just protect it from dust. And when I thought about it, I realized that some of my likely visitors are fairly literal-minded. Specifically, my father and my brother. If I do too good a job dressing up a roll of toilet paper as something else, they're likely not to recognize it as such if and when they need it. "Denise?!? I need some toilet paper!" "Can you turn around and see the doll on the tank?" "That's the extra toilet paper." So in the interests of sanity, it had to be something that would be easily identifiable as toilet paper. That left a linen doily (embroidered with the words "Here be toilet paper"), or a cover that actually looked like a roll of paper. Or I could just have been bored. Idle hands, devil's workshop. That sort of thing.